Elon University’s Center for the Advancement of Teaching and Learning has started a two-year research seminar, “Critical Transitions: Writing and the Question of Transfer,” that will explore the composition skills students learn in the classroom and use in new settings, such as an upper level course, an internship or the workplace. Kristin Warr ’01 (right) will be exploring which writing skills students at the University of Tasmania use within various contexts outside of the classroom. It is the second research seminar hosted by the CATL. Jessie Moore, an associate professor of English and the 2011 seminar leader, said the program comes at a time when interest in the question of writing transfer has increased. “In the fields of writing studies, people are starting to say, ‘We have this assumption that what we’re teaching in one context does transfer. So, let’s test that,’” she said. Forty educators from as far as South Africa and Australia gathered at Elon this month to begin planning research projects that will assess students’ writing skills in transitional phases, such as high school-to-college and college-to-workplace. Participants will answer a research question specific to their university, and at the broadest level, the seminar leaders will produce a statement about transfer based on the completed individual and group projects. Individual projects include the study of possible benefits of online games within writing courses, and a look at how learning about writing issues and theory can assist high school students as they transition to college courses. Groups will explore the way writing with technologies may impact students and the possibilities and challenges students face when writing outside of their native language. Chris Anson, university distinguished professor, professor of English and director of the campus writing and speaking program at North Carolina State University, was asked to join the project as a seminar leader, along with Randy Bass of Georgetown University. Anson says he hopes the research will help teachers better encourage their students. 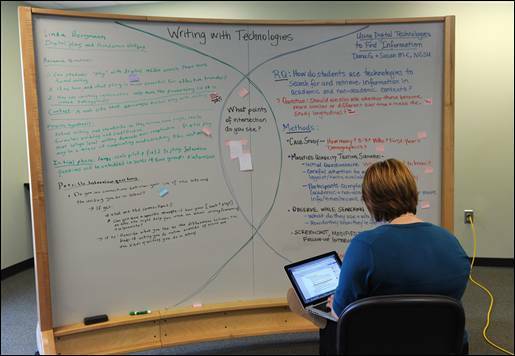 Fourty educators will participate in individual and group projects, with one group focued on writing and technology. Elon alumna Kristin Warr ’01, an associate lecturer for geography and environmental studies at the University of Tasmania in Australia, said she was drawn to the seminar because of the potential impact it could have on university courses. 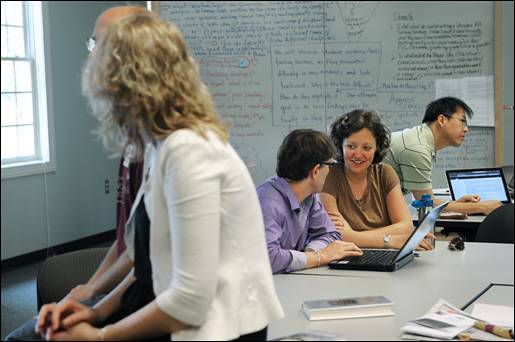 Elon faculty involved with CATL hope the seminar will lead to long-term projects. “I think it would really move our field forward and give us some exciting new avenues for how we think about teaching writing and for future research in writing studies,” Moore said. The participants will meet again in the summer of 2012 to discuss the progress made on their projects. Originally published on Elon University’s E-Net, June 24, 2011.